Students distribute food for Thanksgiving at St. Charles Parish in Bridgeport. Sacred Heart University students gave back to the community and reflected on the many things they’re grateful for this Thanksgiving season by giving thanks at an interfaith service and donating 700 turkeys plus provisions for people in need. Dozens of students involved in Student Government/Student Life, Volunteer Programs & Service Learning (VPSL) and the men’s lacrosse team volunteered at St. Charles Borromeo Roman Catholic Church in Bridgeport on the Tuesday before Thanksgiving, distributing hundreds of turkeys and bags of non-perishable goods to people who were not able to provide the food for themselves. “It’s nice having a big group of kids here helping out the community,” said Nick Piselli, a senior studying finance and economics, as he handed off turkeys to volunteers outside of St. Charles. The Framingham, Mass., student, who serves as vice-president of judicial affairs for Student Government, said this was his third year participating in the distribution, an event he looks forward to each fall. 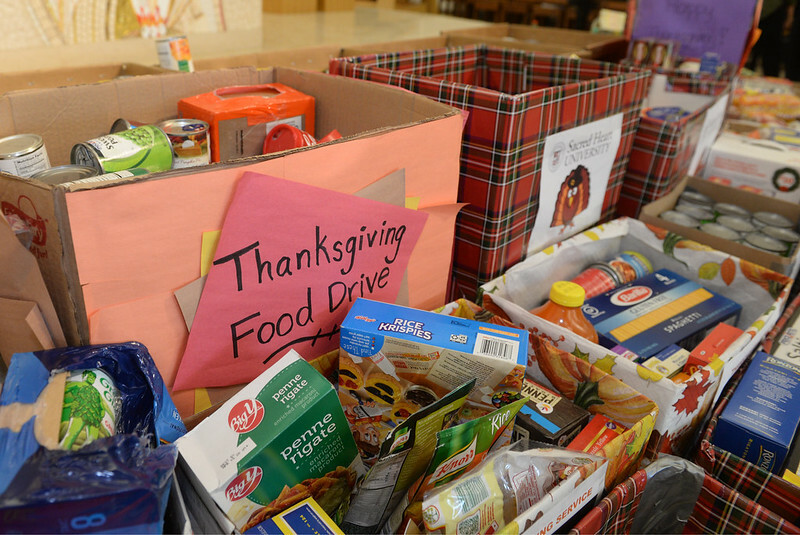 In the weeks leading up to Thanksgiving, VPSL had a food drive and Student Government conducted a turkey drive—a tradition in which the groups have participated for the past eight years. Student Government exceeded its goal of raising $12,000 to purchase 700 turkeys. As of Tuesday morning, more than 200 donors had given $13,474 to the cause. And Annie Wendel, assistant director of VPSL, said her group received triple the amount goods from last year. The day before the distribution, members of the men’s lacrosse team picked up the food items at the Chapel of the Holy Spirit, packed them onto a truck and delivered them to St. Charles. It was there members of VPSL sorted the donations and bagged them. On Tuesday morning, dressed in heavy jackets, hats and gloves, students lifted and carried boxes of turkeys out of a truck. They started an assembly line, opening boxes and passing turkeys on to other students, who put the turkeys next to bags of food items. Community members who were lining up looked on as they awaited the distribution. “A lot of this work started in June,” said Abby Black, a senior studying marketing. As vice-president of the Student Government’s Council of Clubs and Organizations, the Needham, Mass., native said the group followed a timeline from previous years. They worked with the Office of Alumni Engagement to fundraise and were pleased they surpassed their goal. “It’s awesome the students are so excited,” Black said. “It’s nice to do a face-to-face event.” Raising money is a necessary and great project, but to be able to hand off the actual turkeys and food and see where the donations are going is really amazing, Black said. The turkeys were delivered to St. Charles, The Church of the Blessed Sacrament in Bridgeport and the Jesse Lee United Methodist Church in Easton. Wendel said the distribution and drives are a collaborative effort. “It’s great to see everyone come together to support the community – a commitment that is at the heart of the university,” she said. Other organizations that helped the cause include Chartwells, Campus Ministry, SHU Fit and SHU Athletics. Earlier in November, SHU had an interfaith service that incorporated an array of faiths. Prayers and hymns of thanks were shared, as well as a message about giving back and spreading joy.